Perhaps a reader of this blog is able to help me. I am writing about the surrealists and Emily Brontë, concentrating at this moment on Luis Buñuel's Cumbres Borrascosas – Abismos de Pasión - Wuthering Heights, which appeared in 1953. The themes fascinated the director's followers. I particularly want to know about the actress playing Cathy who had the stage name of Irasema Dillian – but any help will be welcomed. Brontë Society members and anyone with an interest in Haworth, past and present, will be saddened to hear of the death of Michael Baumber. Michael was a retired history teacher and his book General-at-sea: Robert Blake and the Seventeenth Century Revolution in Naval Warfare was written over twenty years ago. Michael had detailed knowledge of the Old Testament and his sermons, given as a Lay Reader in the Church of England, were always interesting and anticipated with pleasure. In 2009 his book - A History of Haworth from Earliest Times- was published. 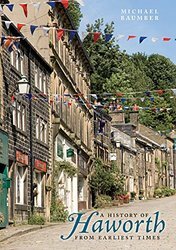 It is a mine of information which emphasises that, although the Brontë family played a big part in making the village known throughout the world, Haworth has a long and fascinating history. Michael was always willing to share his knowledge with others and I was lucky enough to have many a conversation with him about the Bronte family and Haworth itself. He always answered my numerous questions with patience and it was a pleasure to take him, on quite a few occasions, to the County Records’ Offices in Northallerton, when he wanted look at the archives there, when he was researching for one thing or another.The miles would speed past as Michael would wax lyrical about the special project he was undertaking and the journeys were certainly never boring. A learned man- he will be sadly missed. His funeral service will be held at The Church of St. Andrew, Kildwick in Craven, at 10am on 18 September.